I’ve been involved in PR and marketing for around 10 years. I run two businesses, Six of 1 which focuses on developing elite athletes personal and business brands. The second ...Read moreI’ve been involved in PR and marketing for around 10 years. I run two businesses, Six of 1 which focuses on developing elite athletes personal and business brands. The second is Half Dozen Media which is a social media marketing business working with small to large organizations. I specialize in social media engagement, content marketing, social advertising. 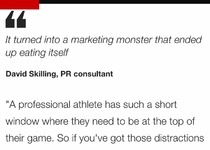 I have been interviewed and quoted by CNN & Yahoo sports on the subject of branding.